Are you a loyal Mac-lover looking for accounting software? You’ve come to the right place! When there are so many accounting options out there, finding the best small business accounting software for Macs isn’t easy — especially now that QuickBooks has discontinued QuickBooks Mac. Luckily for you, we’ve created this list of the top five best accounting software programs for Mac users. Each of these programs offers tons of features and has a 4/5 star rating (or higher) on our site. We’ve picked a variety of accounting software programs that target different business sizes, needs, and price ranges so that you can find the best Mac accounting solution for your small business. Read on to learn which option is right for you. When most people think about accounting software, they’re really thinking about QuickBooks (the notoriously difficult to learn, locally-installed software for Windows). AccountEdge (see our review) offers the same sort of functionality as QuickBooks Pro, but for Mac users. AccountEdge is an on-premise, traditional accounting program. Because AccountEdge is locally-installed, the software is far more developed and offers much more functionality than the other programs on this list. For example, it’s the only software of the five to offer lead management. But these features come at the cost of a steep learning curve. The software is also more limited than its cloud-based counterparts in that there is no mobility and the cost of extra users adds up fast. However, for those with accounting experience who are planning on sticking with one software for a few years, AccountEdge can be an economical choice and may even prove to be less expensive than some cloud-based alternatives. Note: Some features are only available with AccountEdge Pro. AccountEdge Basic costs a one-time fee of $149 for a new user license, while AccountEdge Pro (which includes all of the features listed above) runs $399 for a new user. Each license comes with a single-user; additional users cost extra. Any future AccountEdge upgrades are offered at a discounted rate. If you’re looking for a locally-installed Mac accounting software, you really can’t beat AccountEdge. Read our full AccountEdge review to learn more about this software or give it a whirl with the free 30-day trial. XeroÂ (see our review) has been a force to be reckoned with in the accounting world since 2006. This software (and all of the other Mac accounting options) in this post differ from AccountEdge in one significant way: they are cloud-based. Instead of installing the software on your computer, the software is accessed via the internet. That means that Mac and Windows users alike can benefit from Xero. Xero offers strong accounting, incredible customer service, and an impressive number of positive customer reviews. Xero also allows for unlimited users, something almost unheard of in the accounting world. The software is ideal for medium-large businesses in need of strong accounting and multiple users. Xero allows you to set detailed user permissions and manage multiple companies. While there is a small plan marketed toward smaller businesses, this plan is incredibly limited when compared to similar offerings by other cloud accounting programs (likeÂ WaveÂ andÂ Zoho BooksÂ for example). Payroll is only available inÂ 37 states. Note: Feature access may vary by plan. Visit our comprehensiveÂ Xero reviewÂ for a complete feature list. Xero offers five scalable price plans ranging from $9/mo â $180/mo. Payments are made monthly. Each plan comes with unlimited users. CheckÂ Xeroâs pricing pageÂ for more details. If Xero sounds like it might be a good fit for you, check out our comprehensiveÂ Xero reviewÂ and/or take the software for a spin with aÂ free 30-day trial.Â If you do end up going with this accounting software, take a look at How To Set Up Your Xero Account, a free guide that walks you through how to set up and use your Xero software. QuickBooks OnlineÂ (see our review) was launched in 2004. Since then, this robust software has grown to support over 2.2 million users. QuickBooks Online is cloud-based software with over 500 integrations and beautiful invoicing automations and customizations. In the past, QuickBooks Online was fairly intuitive and required little previous accounting experience, but a recent downgrade in usability has made the software fairly difficult to navigate. However, the software is updated monthly so (hopefully) this could change soon. The software is ideal for all types of small businesses, particularly those in need of strong accounting and ample integrations. It is not a good fit for companies with more than 25 users. Note: Feature access may vary by plan. Visit our comprehensive QuickBooks Online review for a complete feature list. QuickBooks Online offersÂ three pricing plansÂ ranging from $15/mo â $50/mo. Plans are paid monthly and payroll costs an additional $39/mo â $99/mo. CheckÂ QuickBooks Onlineâs pricing pageÂ for more details. If youâre interested in QuickBooks Online, read our completeÂ QuickBooks Online reviewÂ for more details and take advantage of theÂ free 30-day trial. Zoho BooksÂ (see our review) is a complete accounting package with some of the most beautiful invoicing tools I have ever seen. The software was launched in 2009 and is an easy accounting software for Mac users to learn and use. Overall, Zoho Books is incredibly affordable, offers good customer support, has amazing mobile apps, and provides some of the best international business options on the market. Zoho Books is ideal for small to medium businesses (with up to 10 users) that are looking for strong accounting capabilities. Zoho Books has almost all of the features youâd find in QuickBooks or Xero; the only thing the software doesnât offer is payroll or budgeting, so users in need of built-in payroll may want to look elsewhere. Note: Feature access may vary by plan. Visit our comprehensiveÂ Zoho Books reviewÂ for a complete feature list. Zoho Books offers three pricing plans ranging from $9 â $29/mo. Plans are paid monthly. Features varyÂ by plan. Check outÂ Zoho Bookâs pricing pageÂ toÂ learn more. If Zoho Books sounds like it might be the best Mac accounting software option for your business, or if youâre interested in learning more, be sure to read our completeÂ Zoho Books reviewÂ and take advantage of theÂ free 14-day trial. WaveÂ (see our review) is the best free accounting software for Mac users. And just because itâs free doesnât mean itâs skimping on features. The software is incredibly robust and very easy to use. Wave offers strong accounting, decent invoicing, and built-in lending. The customer support is great and user reviews are positive almost across the board. The ability to separate personal and business expenses makes Wave ideal for freelancers and microbusinesses, while complex accounting features (like a detailed chart of accounts) will meet the needs of most any small business. The software is ideal for businesses looking to save a bit of money. There is an Etsy-integration as well, which makes Wave a perfect choice for Etsy sellers. The software is not ideal for users in need of cash-basis accounting. As I mentioned earlier, Wave is a free accounting solution. However, there are a few extra costs to be aware of. Namely, payroll and credit card processing come at an additional price. Be sure to checkÂ Waveâs pricing pageÂ for the full scoop on these costs. If this free software sounds tempting, youâll want to read more about it in our fullÂ Wave review. You can alsoÂ sign up for a free Wave accountÂ to give it a try (and cancel at any time). When it comes to choosing the best small business accounting software for Mac users, we couldn’t pick a single favorite. There are several great Mac accounting options, and choosing which one is right for your business will ultimately depend on your business’s size, needs, and price range. AccountEdge:Â AccountEdge is the best locally-installed accounting software for Mac users. The software offers more features than any of the other Mac accounting software alternatives, but there is a learning curve and the software is not ideal for businesses with multiple users. Xero:Â Xero is an incredibly robust accounting option that is ideal for medium to large businesses. The software also has a bit of a learning curve, but it offers unlimited users and great customer support. QuickBooks Online: QuickBooks Online is one of the best small business accounting options. It has hundreds of integrations and plenty of features for most businesses. The software isn’t the easiest to use, and customer support can be a hit or miss. Zoho Books: Apart from Wave, Zoho Books is the easiest accounting software for Mac users to learn. It offers true accounting, beautiful invoicing, and competitive pricing. The software is ideal for small to medium-sized business who don’t need payroll or a lot of integrations. Wave:Â Wave is the best free accounting software for Macs. The software offers true accounting, but is easy to use and suits the needs of freelancers, micro businesses, and most small businesses. It’s not as comprehensive as AccountEdge or Xero, but the price tag is enticing. If you’re set on a locally-installed program, then the decision’s already made for you — AccountEdge is the way you should go. If you prefer the mobility of cloud-based software, then Xero, QuickBooks Online, Zoho Books, or Wave would be better options. For additional help choosing which software is best for your small business, readÂ 10 Questions To Ask Before Choosing Accounting Software. I also highly recommend reading our reviews and taking advantage of free trials before committing to any solution. Read theÂ Complete Guide to Choosing Online Accounting SoftwareÂ andÂ Accounting Software: Cloud-based or Locally Installed?Â for extra help. Good luck on your journey to finding the perfect accounting software for your Mac, and feel free to reach out if you have any questions along the way. The post Best Accounting Software For Macs appeared first on Merchant Maverick. Should You Pay For Business Expenses With A Line Of Credit Or A Credit Card? Credit cards and lines of credit share many characteristics. You may even be wondering how they differ at all, and whether it’s better to make your business purchases with one or the other. In fact, there are a few key differences that can help you determine when to use one or the other. Credit cards are technically revolving lines of credit, though they aren’t often called that. As you pay off your balance, that credit becomes available to use again. Beyond that, both credit cards and lines of credit accrue interest on any outstanding debt. The most obvious difference is that not all lines of credit are “revolving.” When a bank extends you a line of credit, it may be a one time offer. Usually, when a financial institution extends a non-revolving line of credit it’s to cover a specific expense the borrower is seeking to fund. Unlike a loan, a line of credit gives the borrower some extra flexibility to negotiate with vendors. The differences between revolving lines of credit and credit cards are a bit more subtle. For starters, a line of credit often comes with more fees than does a credit card. You may, for example, have to pay a monthly or annual fee to keep your line of credit open. While some credit cards (particularly business credit cards) do come with annual fees, it’s not hard to find ones that don’t. Some lines of credit will also charge a fee every time you make a withdrawal. Though it will vary from case to case, you can also generally get a higher credit limit through a line of credit than with a credit card. Both credit cards and lines of credit come in secured and unsecured forms, though with credit cards you’ll only want to go the secured route if poor credit keeps you from qualifying for a traditional card. Since lines of credit can be secured by assets, it’s not unusual to see better interest rates there than with credit cards. Note that it’s a lot easier to get a credit card than a line of credit, although getting an elite credit card can be challenging in its own right. The biggest difference between a line of credit and a credit card is convenience. Credit cards are designed to make retail purchases easy. Most businesses these days are equipped to swipe your card (or read your chip) at theÂ point of sale. With some rare exceptions, it’s not easy to applyÂ for a loan at the time of purchase. Credit cards are also more ubiquitous in this card-driven online market. Chances are you’ve regularly used your credit card on Amazon, to pay your cell phone bill, or make a security deposit. It’s just as easy to use your credit card for common expenses. In fact, credit card companies try to encourage you to do so through reward programs. The terms of these programs vary, but essentially they all return a small percentage of the money you spend in the form of statement credit, cash, gift certificates, or other products. Another perk you’ll see with credit cards that you won’t often get with lines of credit are introductory offers like 0% APRs. If your card is still within that introductory window and you expect you’ll be paying your bill off over the course of several months, the credit card is a clear winner. At this point, it may look like credit cards have a clear advantage over lines of credit. Not so fast. One thing credit cards are really inefficient at is cash transactions. Most credit cards will only let you cash advance a fraction of your total limits. Even then you’ll usually incur very high-interest fees on that cash. Lines of credit, on the other hand, are convenient whenever you need to produce a good chunk of cash on short notice. You won’t incur premium fees for withdrawing that money and you won’t be limited to only a fraction of your credit limit. A line of credit’s lower interest rates may also make it preferable when we’re talking about big ticket items you can’t pay off quickly. If you’re using your credit card optimally, you shouldn’t be paying any interest on it at all; you’ll be paying it off in full each month. If you can’t do that, a line of credit may often be cheaper over the long run and have a more structured repayment scheme than a credit card. Credit cards and lines of credit can both provide additional financial heft for your business. Knowing when to use each one could make the difference between convenience and unnecessary debt for your business. Check out our comparison features if you need help finding aÂ credit card or a line of credit. The post Should You Pay For Business Expenses With A Line Of Credit Or A Credit Card? appeared first on Merchant Maverick. It may seem most natural to use a business credit card when you’re making purchases on behalf of a business — whether it’s your business or you’re an employee — but there’s a good case to be made for using personal credit cards to cover business expenses instead. For one thing, the CARD Act of 2009 provides a number of legal protections to users of personal credit cards — legal protections that don’t apply to business card users. If you use a personal card, you can’t have your introductory APR revoked before six months have passed, nor can you be charged excessive fees for minor infractions. You also can’t have your APR raised without first having 45 days’ notice of the change. While business card issuers often extend these protections to consumers as a courtesy, this isn’t a universal practice. You might also find that the rewards programs associated with personal credit cards fit your spending patterns more closely than the incentive programs of business card issuers. Whatever the reason, using a personal credit card to cover business purchases is a common practice, and there’s nothing inherently wrong with it. However, that’s not to say there aren’t any pitfalls to avoid. Here are some tips for using personal credit cards to cover business expenses. One thing you’ll want to avoid is comingling business and personal expenses. A good way to avoid this is to use a separate credit card for your business purchases, even if that card is a personal card. This way, you won’t have to go through all your purchases one-by-one on your existing personal card to determine which purchases were business-related and which weren’t. Keeping your business purchases exclusively confined to one card is helpful in a number of ways. If you’re an employee, you’ll be able to report your business expenditures more easily. And regardless of whether you’re an employee or the owner of a business, confining your business purchases to one separate card will make dealing with the IRS less painful in the event of an audit. If you charge business and personal expenses on the same card, you may have a harder time proving to the IRS that your business charges really were business charges. Even if you don’t get a separate card for business use, whatever you do, don’t make business purchases on your debit card. Doing so is a good way to get a hold placed on your own money. Entities like hotels and rental car agencies will typically place a hold on your card — often for hundreds of dollars. In this way, work-related purchases can end up sapping your personal funds. Don’t do it! Even if you use a separate personal credit card for all your business-related expenses, know that you can negatively impact your personal credit score with your business purchases. If you charge a large business purchase to your card, your credit utilization ratio will be affected until you get reimbursed (your credit utilization ratio is the amount of debt you have vs. the amount of your credit limit). For this reason, if you’re applying for a loan of some kind, you might want to avoid doing so while you have a large as-yet-unreimbursed business expense on your card. If you do, you may well end up paying a higher interest rate on your loan. A recent report from CareerBuilder found that 78% of full-time workers in the US live paycheck-to-paycheck. With this as our grim reality, it’s no wonder that many workers are tempted to use their reimbursement funds to pay other bills. However, you should really avoid doing this if at all possible. If you don’t pay down your card with your full reimbursement amount, you’ll be paying interest on a purchase that wasn’t even for you. Unless doing so would make you homeless, pay off that card as soon as you get that reimbursement check. Otherwise, you’re just throwing money away in the form of interest payments. A good way to both streamline the reimbursement process and satisfy the IRS in the event of an audit is to be fastidious about record-keeping. Use a smartphone app to save pictures of receipts from all your business purchases, along with pictures of the reimbursement checks you receive (or screenshots of the direct deposit). You may even want to jot down additional information on your business receipts before archiving them, such as those who were with you and the date/time of the transaction. Generally, the more information you can provide about your business purchases, the better — whether it be to the IRS,Â or if you’re an employee, to your boss. Naturally, when you’re considering which credit card to use for business expenses, you’ll be comparing interest rates and fees as you seek the best deal. However, don’t forget to compare the rewards programs of the personal cards you’re considering as well. The nature of your business will determine the sort of items and services you’ll be charging to your new card, so be sure to choose a card with rewards that align with your anticipated business expenses. If you get a personal credit card to use for business expenses, make sure to actually use it. If you go for a long period of time without charging anything to the card, your credit card issuer might shut down your account due to inactivity. This can negatively impact your credit score. If you’ve ever been in a company where you’re expected to cover business expenses, you know how frustrating it can be when your reimbursement doesn’t come in a timely manner. It obviously impacts the amount of credit you have available, and — as I’ve discussed — can affect your credit utilization ratio as well. Try to ensure that your company’s reimbursement policies are reasonable before agreeing to make business purchases on behalf of the company. And if your reimbursement is delayed and you have to pay finance charges as a result, insist on being reimbursed for that as well. No employee should be made to suffer negative consequences as a result of a company’s lackadaisical reimbursement practices. For both business owners and employees, it’s perfectly reasonable to use a personal credit card to cover business expenses. By following these rules of thumb, you can avoid taking a personal financial hit when charging business expenses to your personal credit card. The post A Guide To Using Personal Credit Cards For Business Expenses appeared first on Merchant Maverick. On this week’s episode of “Meet The Merchant Maverick Team,” we’ll be exploring the life and times of Linda Leewaye, our newest Maverick. Linda is an SEO expert and an Idaho potato who currently hangs out in sunny California. But what makes Linda LeewayeÂ really tick? Let’s read on to find out! Proudest professional moment: Organizing an Aveda Earth Month Trashion Show charity event with my PRSSA group and donating the money to a clean water initiative for those who don’t have access to clean drinking water. Favorite Merchant Maverick post/moment/opportunity: The opportunity to work with the friendliest people on the planet and work from anywhere is a dream come true. What do you do when you’re not working? : Obsess over the latest superhero movie and play games with my friends. What movie character do you identify most with and why? : Batman. In all honesty, I am not as cool as he is, I just wish I was! I appreciate his crazy ninja moves and detective skills to go with it…along with the billions of dollars from the Wayne family fortune. Favorite song: Stairway to Heaven by Led Zeppelin. Favorite â80s movie: Raiders of the Lost Ark. If you could travel to any time period to live forever, where/when would it be? : The Egyptian Era, so I could cure my innate curiosity of how the pyramids were built. You’re given anÂ unlimited budget to travel. Where do you go? For how long? : I’d travel closer to the North Pole so I catch a glimpse of the Northern Lights! And after that, I’d go to every tropical island on the face of the earth to thaw out. Then, I’d backpack around Italy, Spain, and France, seeing as many cathedrals and monuments as I can. I’d love to travel as much as possible and for as long as possible — well, until I become unbearably homesick and miss the States! We’re so pleased to have Linda on the team now — not only because her SEO skills are lifting us to new heights, but because it’s nice to have another superhero-loving geek in our posse. We look forward to many future hang-outs together, getting the Led out and watching a little pre-ruined Indiana Jones. Linda, you bring the Kettle chips. Interested in reading about other members of the Merchant Maverick staff? Check out our team interview series. The post Team Bio Series — Linda Leewaye (The SEO Queen) appeared first on Merchant Maverick. A business credit card is an incredibly valuable tool for small companies. It allows you to keep your business spending separate from your personal charges, and to extend purchasing power to your employees. Furthermore, the right small business credit card can offer you valuable rewards in the form of points, miles, or cash back. The ability to earn points and miles has its benefits, but many business people still prefer to receive cash back rewards from their credit card. Cash back can be used for anythingÂ and is never subject to the whims of the airlines and hotels, which frequently change the terms and conditions of their loyalty programs to make points and miles less valuable. And with cash back cards becoming increasingly competitive, now is the time to look for a card that can offer you the most rewards for your business spending. Which Kind Of Cash Back Card Should You Choose? Cash back cards for small businesses can be divided into two different categories. First, there are the cards that offer a single rate of return on all purchases, typically between 1% and 2%. Then there are the small business cards that offer bonus cash back on specific qualifying purchasesÂ while earning just 1% on everything else. To make this more complicated, many cards restrict the total dollar amount of purchases each year that qualify for the bonus, and youâll earn just 1% back on all subsequent purchases. These limits can be imposed based on the calendar year or the cardmember year. Hereâs a list of the best cash back business credit cards. First, weâll look at the ones that offer strong rewards on everything you buy, followed by those that feature bonus rewards on some purchases. Some small business owners are content to use the same cash back rewards credit card for all purchasesÂ and want to earn the highest rate of return they can without having to worry about bonuses. In the past, it was common for small business cards to offer a mere 1% cash back on all purchases, but that is no longer considered to be a competitive rate of return. Today, the best small business cash back cards that offer the same rewards on all purchases will give you at least 1.5% cash back. Some of these cards will do so with no annual fee, but you should expect to pay more for cards that offer higher returns. It also makes sense to look at the benefits offered by these cards, as well as other possible fees, such as those for foreign transactions. Capital One offers a full line of small business credit cards under its Spark brand, which includes cards that offer points towards travel or cash back. The Capital One Spark Cash small business card offers you 2% cash back on all purchases, with no limits. New cardholders can also earn $500 in cash back after using their card to spend $450 within three months of account opening, one of the best cash back sign-up bonuses offered anywhere. Other benefits include free employee cards as well as quarterly and annual spending reports. Your purchases are also covered by damage and theft protection policies for their first 90 days, and an extended warranty that can add one year to your manufacturerâs warranty. As part of the Visa Signature program, the Capital One Spark Cash also offers a range of travel and shopping benefits and discounts. For example, you can receive a third night free and premium benefits at luxury hotels around the world as part of the Visa Signature Luxury Hotel collection. The $95 annual fee for this card is waived the first year, and as with all Capital One cards, there are never any foreign transaction fees. This card is very similar to the standard Capital One Spark card, but it offers 1.5% cash back on all purchases with no annual fee. Therefore, this card makes the most sense for those who have more modest spending requirements that donât justify the annual fee of the standard Spark Cash card. With this version, new cardholders can earn a $200 cash bonus when they spend $3,000 on their card within three months of account opening. It includes many of the same benefits as the standard Spark Cash card, such as purchase protection and extended warranty coverage. Itâs even part of the Visa Signature program, which is rare for a card with no annual fee. This small business card offers you cash back in a unique way. First, the Plum Card from American Express is a charge card, not a credit card, so you are required to pay your entire statement balance in full, every month. But when you make your payment within 10 days of your statement closing, youâll receive 1.5% cash back on all of your purchases. Alternatively, you can take up to 60 days to pay your balance, but without receiving any cash back. This card makes sense for small business owners who may prefer to earn rewards some months and help manage their cash flow and extend payment at other times. New applicants can earn up to $600 in cash back, but with a large minimum spending requirement. You will earn a $200 statement credit after each $10,000 you spend on the card, up to $30,000, within the first three months of opening your account. Other benefits include extended warranty coverage and a purchase protection program. The card also comes with anÂ account manager feature that lets you delegate a trusted individual that can manage your business card. American Express small business cards participate in the OPEN Savings program, which offers discounts on purchases from FedEx Express and FedEx Ground, HertzÂ®, HP.com, and others. The $250 annual fee is waived the first year, and there are no foreign transaction fees. This card features 1.5% cash back on all purchasesÂ and has no annual fee. New accounts can earn $500 in bonus cash back after spending $5,000 within three months. Cash back can be applied automatically as a credit to your account or deposited to your eligible checking or savings account each quarter. Or, you can receive your rewards in the form of points that can be redeemed for merchandise, gift cards, or airline tickets, with a 10% bonus when you redeem your points online. This card also features cash management tools and spending reports that are available online. Thereâs no annual fee, and you can add up to 99 additional employee cards at no extra cost. There are also no foreign transaction fees. When you have a small business rewards card that offers you the same amount of cash back for all purchases, the most you can possibly get is 2%. But when your small business card offers you bonus rewards for buying certain items,Â itâs possible to earn as much as 5% cash back on some of the purchases you make the most. As a trade-off, youâll only earn 1% cash back on all purchases that donât qualify for a bonus. Costco stores are known for their low prices on bulk goods, and this model also appeals to small business owners. The Costco Anywhere VisaÂ® Business Card from Citi is one of the strongest cash back small business cards that offers bonuses on many purchases. With this card, you can earn 4% cash back on your first $7,000 spent each year on gas purchases, including those from Costco, and 1% after that. You also earn 3% cash back on all restaurant and travel purchases worldwide,Â 2% cash back from all Costco purchases and 1% cash back everywhere else. This card includes damage and theft protection that covers your eligible purchases for 120 days (90 days for New York residents) as well as an extended warranty policy that can add a year to your manufacturerâs warranty. You also receive worldwide auto rental insurance, travel accident insurance and access to a travel and emergency assistance hotline. Thereâs no annual fee for this card with your paid Costco membershipÂ and no foreign transaction fees. US computer hardware, software, and cloud computing purchases made directly from select providers. The 5% and 3% cash back offers only apply to your first $50,000 in purchases each calendar year, and youâll earn 1% thereafter. Note that the cash back earned is automatically credited to your statement each month. This card also includes 9 months of interest-free financing on new purchases before the standard interest rate applies. Other benefits include a roadside assistance plan, a baggage insurance policy, and car rental insurance. Your purchases will be covered by an extended warranty policy as well as a damage and theft protection plan. Thereâs no annual fee for this card, but there is a 2.7% foreign transaction fee imposed on all charges processed outside of the United States. This premium small business card from Chase offers Ultimate Rewards points, and you have the option of redeeming them for cash back or other options. New accounts can earn 80,000 bonus points after spending $5,000 within three months of account opening. You’ll also earn three points per dollar on your first $150,000 spent in each account anniversary year in combined purchases on travel, purchases, internet service, cable and phone services, and on advertising purchases made with social media sites and search engines. You can earn one point per dollar spent on all other purchases. Points can be redeemed for one cent each as cash back or statement credits. Other options include transferring your points to miles with nine different frequent flyer programs or using points with four different hotel programs. Notably, your points are worth 25% more when you make travel reservations through the Chase Ultimate Rewards travel center. Finally, points can be redeemed for approximately one cent each towards merchandise or gift cards. Also included in this card’s benefits are trip Interruption and trip cancellation insurance, and a cell phone protection plan. You’ll receive accidental theft and damage insurance, as well as an extended warranty policy that can add up to a year of coverage to your manufacturer’s warranty. This card has aÂ $95 annual fee and no foreign transaction fees. This entry-level small business card offers you 5% cash back on your first $25,000 spent in combined purchases at office supply stores and on internet, cable and phone services each account anniversary year. You’ll earn 2% cash back on your first $25,000 spent in combined purchases at gas stations and restaurants each account anniversary year, and 1% cash back on all other purchases. Benefits include purchase protection and extended warranty coverage. When traveling, you also have access to travel and emergency assistance services, as well as a roadside dispatch hotline. Thereâs no annual fee for this card, but a 3% foreign transaction fee is imposed on charges processed outside of the United States. This small business credit card can offer you up to 3% cash back on some of your business purchases. You’ll earn 3% cash back at gas stations and at office supply stores on up to $250,000 spent each year, and 1% cash back after that. You also earn 2% cash back on purchases at restaurants and 1% cash back on all other purchases. New accounts can earn $200 in cash back after spending $500 within 60 days of account opening. New accounts will also receive nine months of 0% APR financing on new purchases before the standard interest rate begins to apply. 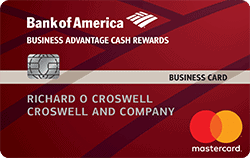 Points are available for cash back after earning $25, and you can choose to redeem your rewards as a statement credit or have cash deposited into a Bank of America small business checking or savings account. Thereâs no annual fee for this card, but it does have a 3% foreign transaction fee. For a concept as simple as cash back, there are actually quite a lot of different small business credit card offers available. It’s important to do your research and select the one that will offer you the most benefits. While some small business owners will need to choose between cards with bonus offers and those without, others may be able to maximize cash back by carrying at least one of each. Closely examine the features and benefits of each of the cards above, and you’ll have all the information you need to find the card that best meets the needs of your business. The post The Best Cash Back Business Credit Cards appeared first on Merchant Maverick. Credit cards are a common sight in wallets and purses, used for nearly a third of all in-person purchases. There’s nothing strange or novel about them. And yet, despite their ubiquity, there are a lot of misconceptions about how credit cards work and the best way to use them. Should you use them regularly, or only for infrequent, major purchases? Do they help or harm your credit? Here are five things you may not know about credit cards. You’ve probably heard at some point that it’s good to carry a small balance on your card every month, ostensibly to build your credit and keep your credit card company happy. Turns out that’s completely false. Personal credit cards are required to give you a 21-day or more grace period before they can start charging interest on a purchase. Business credit cards don’t have that hard and fast guideline (see below), but they usually do extend a grace period as a courtesy. If you pay your balance off within that time, you won’t owe any interest on your purchase and you’ll still earn whatever reward points your card offers. But might your credit card company cancel your card if you don’t pay them interest? It’s unlikely. The company still makes money off transaction fees when you swipe your card. Now, there are times you may find it convenient to put a big purchase on your card and pay it off slowly. There’s nothing wrong with that — just know that you’re not achieving any greater ends by delaying repayment. Since you now know you can safely use your credit card without paying interest, you don’t have to be scared of using it. Which is a good thing!Â If you don’t use your card, your credit card company may simply cancel it. There’s no telling when or if that will happen, but if you haven’t used your card in a couple months, the chances of your card being canceled increase. If your card is canceled, don’t take it personally. You didn’t do anything “wrong,” you just weren’t making your credit card company any money. It’s often possible to get the decision reversed with a timely phone call. Credit card rewards systems can be divided into a number of different categories, but one of the oldest and most popular is the cash back card. It’s a simple reward structure. For every dollar you spend, a small percentage of that payment is returned to you in the form of statement credit, a check, or a gift card. Turns out most reward cards will let you cash in accumulated reward points for statement credit, even if they aren’t cash back cards. This can be handy when you simply need to shave a few dollars off of your statement for the month. So why would you ever get a cash back card? Cash back cardsÂ tend to reward generic purchases at a higher rate than other reward schemes, which give you a higher return for buying specific types of goods and services (flights, hotel stays, office supplies, etc.). If your purchases are concentrated in a particular area, you may want a rewards card. If there’s not much of a pattern, consider a cash back card. Giving customers enough time to pay their bills. Payments are applied to the highest-interest debt first. They’re great protections for credit card users. And they don’t apply to business credit cards. Business credit cards are still something of a wild frontier, with terms and rates that can change with little notice. To entice customers into this riskier landscape, credit card companies will usually reserve their best reward programs for business credit cards. If you’re someone who reliably pays off your credit card every month, the risks are small. If you carry balances — and especially if you miss payments — you may find yourself facing very unfavorable terms. Just like there’s no duck in that packet of duck sauce, there’s no business in business credit cards. Okay, that analogy isn’t great, but the fact remains that (most) business credit cards can be acquired by individuals who don’t actually have businesses. In fact, even if you do have a business, you have to sign a personal guarantee to get a business credit card. That means you are personally accepting liability for the debt, which essentially waives the financial partition you would otherwise enjoy between your business and yourself if you were incorporated. On the other hand, if you’re purchasing a high volume of goods and services as an individual and want to cash in on business card rewards and perks, you’re able to do so. If you want a credit card that respects corporate protections, what you need is a corporate credit card. Just be aware that you’ll have to be doing over $4 million/year in revenue to qualify for most of them. Hopefully, you’ve found one or more of these credit card tidbits illuminating and have some new ideas about how to make the best use of your plastic. If you’re looking for a card for your business, check out our business and personal credit card comparisons. The post 5 Things You Didn’t Know About Credit Cards appeared first on Merchant Maverick. Let’s get right into things. Today we’re looking at Shopventory vs. Square for Retail. Why? Because if you need more inventory support than the basic Square Point of Sale app offers, they are your two best bets. Square (see our review) has been a pivotal force in the mPOS space since its beginning, but lately it has also been edging into the tablet POS market with an ever-growing number of features. Shopventory is newer, but it’s carved a niche out for itself as a supplement to not just Square, but also PayPal Here, Clover, and now even Shopify. While Square dominates the mobile space as far as features, it lags behind tablet-based systems, particularly in terms of inventory. But now there’s Square for Retail. If you need more comprehensive inventory features, you’ll get them with an upgrade to Retail. Shopventory is a monthly service that integrates with your Square account. While Square for Retail is a full-fledged POS, Shopventory is strictly an inventory-focused add-on for Square for Point of Sale. It replaces most of the in-app inventory management with its own web browser but it does keep the inventory lists automatically synced and generates reports. A really quick disclaimer before we get onto the comparison: We’re not looking at the full Square for Retail app here (which I’ll also refer to as just “Retail” or “the Retail app”). We’re just focusing on how its inventory management tools stack up against Shopventory’s. It’s important to consider whether the cost of either service justifies its use. Retail offers many of the same features as Shopventory, but also includes employee management. However, it could be a more costly service given that the subscription is monthly per register. Shopventory offers monthly inventory management for three locations for less than the cost of one Square for Retail register subscription. You don’t get everything that the standard Point of Sale app offers either, such as offline mode. In fact, the Retail app is more of a pared-down version of the POS app, but with more beefed up inventory and reporting. That’s not to say Shopventory offers all the inventory tools you could ever need, either. But it certainly seems to have the upper hand in terms of capabilities and pricing. I think for the most part that either of this will do well. Although they might not be perfect, they’re both capable. But in the end, Shopventory has more features and more competitive pricing. I would test it out before upgrading to Square for Retail. For more information, I encourage you to check out our full Shopventory and Square for Retail reviews. Otherwise, read on for our Shopventory vs. Square for Retail comparison and see how they stack up in the great battle for inventory management! Both of these services offer enough that they merit full reviews in their own right. Our comprehensive reviews of Square and Shopventory explore the advantages and limitations of each. For simplicity’s sake, I am going to focus on three core aspects of inventory management and see how they stack up: inventory tracking, reporting, and purchase order/vendor management. With both Shopventory and Square for Retail, merchants get the ability to count inventory and have each sale deducted from total stock numbers. Both offer location management as well. You’ll be working with Square’s standard item listings, which means you can include all of the following: product name, photo, SKU/barcode, item description, and item variants with the option to set different price points. Shopventory works by syncing with Square. It pushes its inventory data (item prices, bundles, etc.) into the POS app and pulls sales data from Square into its own dashboard reports and updates the inventory counts in real time. Once you get inventory set up, you manage everything inventory-related through Shopventory, NOT Square. It might take some merchants a while to get used to that, especially if they’re used to relying on the Dashboard. Shopventory’s pricing plan, which I’ll cover in the next section, focuses on the number of locations you use, not the number of registers or products. And setting up multiple locations is actually very easy. When you log into Shopventory, the dashboard asks you to create a location and then add an integration (that is, link to your POS). It works a little bit differently for each software, but here’s what you need to know for Square. If you have separate Square logins for each location, that’s fine and you can connect each Square account to each location. However, if you take advantage of Square’s free location management instead, Shopventory will ask you to select a location from your list of Square locations after you connect the POS. (That means you should set up your locations in Square before you setup Shopventory.) If you’re using employee management and device codes to run multiple registers, it doesn’t matter. Shopventory tracks everything at the location level. After you’ve created your locations and linked your POS systems, Shopventory will ask you to enable two major settings: “sync items and variants” and “sync item quantities.” This will establish the connection and effectively make Shopventory your primary inventory service. Once you’ve set up Shopventory, you’ll continue to use Square POS as usual. Just make sure that you log into Shopventory to pull inventory and sales reports. This is especially important if you’re using the Shopventory-specific inventory features like bundles. Everything is synced in real time so you can log in and check whenever. Bundles: Square doesn’t support bundling, but this feature allows you to track raw ingredients, deduct gift basket items from main inventory stock and even keep track of goods sold at wholesale versus retail. It also allows for tracking of items by partial quantities (yards of fabric or goods sold by the pound, etc.) The bundling feature even includes bundle variants. None of this is currently supported by Square for Retail. Low-Stock Alerts: You can set a custom threshold for each item, so you know when it’s time to reorder something. Automatic Restocks On Refunds: You’ll have to enable this feature, as it isn’t turned on by default. It also doesn’t work on partial refunds in Square. Multi-User Access: Shopventory also allows you to create multiple accounts with different permissions. Enable your managers and staff to better manage store inventory while ensuring accountability. Inventory Transfers Between Locations: Is one location out of a product while another has too much of it? Use the Shopventory dashboard to keep track of internal transfers of merchandise. Inventory History: Shopventory keeps a log of your inventory history, including when counts go up or down. When you manually adjust stock counts you can add a note to indicate why (theft, damaged goods, etc.). We’ll get a little bit more into some related features when we talk about reporting. Inventory Reconciliation Tools: If you’re a bit old-fashioned, Shopventory does offer an easy downloadable reconciliation sheet for inventory. Just the basic details that you need, not a lot of extra information, which you can download via printable PDF or spreadsheet. However, Shopventory has also introduced a barcode scanner mobile app for inventory reconciliations. Each Shopventory user can download the app and scan and update inventory counts through the app, and Shopventory will keep a record of when and who was responsible. This is actually a pretty awesome tool. Barcode And Label Printing: Shopventory lets you chose from a Dymo or Brother label printer, as well as computer printing on Avery label sheets. Square for Retail works pretty similarly to Square Point of Sale. Everything is controlled from the Square Dashboard or the app, though the dashboard gives you the most functionality. Even though the app (or at least parts of it) will look very different from the free version, your dashboard should look pretty much the same and the data entry process will be the same. If you have a lot of inventory (and if you’re looking at this article, you probably are), the odds are good you don’t want to create each inventory item one by one. That’s where Square’s Bulk Upload feature comes in. You can download the spreadsheet template, populate it with your inventory, and upload your item library all at once. Likewise, you can also export your library to a spreadsheet if you need that data elsewhere. Your item descriptions are nearly identical to the standard Square offering. Even though Square for Retail doesn’t display photos in the app, you can upload them for viewing the back end. Check out Square’s how-to video for creating items manually. Technically, Square for Retail gives you access to the Inventory Plus features, but these are really (mostly) reporting tools or PO/Vendor management. So some of these features are actually just Square’s inventory features. Employee Management: Square includes employee management at no additional charge with a Square for Retail subscription. So if you have a lot of employees this could end up being a good deal for you. You can set different user permissions, track time, and more. Inventory Transfers Between Locations:Â Square initially required you to manually add or subtract inventory at different locations to record transfers, but that’s no longer the case with the Retail app. Now you can record merchandise transfers in the app. Inventory History: Another feature that wasn’t present at Square for Retail’s launch, inventory history will show you all your sales, transfers, received shipments, etc. to show why your inventory count is what it is. Barcode And Label Printing: Like Shopventory, you can choose to use one of two select label printers (A Dymo or a Zebra) or print from a computer onto standard Avery labels. Vendor Library: All items associated with a particular vendor (as well as their prices) are stored in each vendor’s data file. Note the lack of bundling features hereÂ and all that this entails: no bundles, no raw ingredient tracking, no partial ingredient tracking. This is one of the biggest limitations to Square’s inventory. However,Â Square also doesn’t offer any sort of inventory reconciliation. You could download your inventory for export and modify the spreadsheet, but it’ll take a bit of work on your end to make that happen. But that’s just for inventory management. We’ve still got to talk about reporting and purchase orders/vendor management. First of all, Square’s reporting tools, overall, are pretty robust. (Check out the list of reports. )Â Shopventory’s reports exist mostly as an extension of Square’s, not a replacement for them. This makes sense given that Shopventory is an extension of Square, not a standalone app.Â In addition to some identical reports, Shopventory offers several reports thatÂ Square doesn’t — and a couple that Square for Retail doesn’t, either. Square’s inventory reports are somewhat lacking. Specifically, something that merchants have been clamoring for is cost of goods sold (COGS) reporting. Square for Retail finally offers this feature, but thus far it hasn’t impressed. Editing the item costs isn’t easy to begin with, and the information isn’t available at key points in the Retail app experience. And all of that’s left merchants understandably upset. However, you can also keep a record of additional costs associated with a purchase (such as shipping or handling fees) that are added to your COGS tracking. That’s helpful. In addition to COGS reporting, Square for Retail introduces a profitability report and an inventory by category report that listsÂ the value of the items, projected profit, and profit margins in each category. This last report is more a combination of several other reports, but it’s nice to see. On the other hand, Shopventory’s COGS reporting is a bit more advanced. Accessing pricing information seems a bit easier than with Square for Retail. Shopventory also tracks lot costs in addition to default costs. For advanced users, Shopventory has a cost averaging feature.Â You can even back-fill lot costs using the default cost feature. But apart from cost and profitability reporting, there’s another feature I like that Shopventory offers: a dead inventory report. You can print off a list of every item that hasn’t sold recently, and specify just how “recently” you want — whether it’s a week, a month, six months, etc. This is pretty handy because “slow” for one business isn’t slow for another. It’s hard to ignore the fact that Shopventory outclasses Square for Retail in terms of reporting — it offers everything that Retail does, plus more. I’ve found that Shopventory and Square dashboards are both fairly intuitive and easy to use, so they’re evenly matched in that regard. Since the upgrades to inventory and reporting tools are relatively small in Square for Retail, it’s nice to see that the additions in this category are actually pretty big game-changers. With the Retail app, it’s now possible to create purchase orders from within the Square dashboard and send them via email. You can also receive inventory from within the Square for Retail app. If I’m being honest, Square for Retail and Shopventory are well matched in this category. There are a few differences — for one, with Shopventory you can only receive inventory through the web dashboard, not the app. But I think that, overall, their feature sets are pretty similar. While you’ll need to use the Square dashboard to create purchase orders, you can receive stock from a PO directly in the Square for Retail app, which is nice. With Shopventory, everything has to be done from the dashboard, which is a major trade-off. However, it shouldn’t be a dealbreaker. A few other features from Square that I like: You can create a new vendor listing from within a purchase order, whereas with Shopventory you must have all of your vendors already entered. You can also edit and cancel purchase orders as needed, and Square keeps an archived file. I mentioned previously that Square does have an item library associated with a vendor, but I don’t think it’s the most effective display. When you add an item to the PO it is added to the vendor’s item library, but you can’t browse the item library while creating a PO. Instead, you need to search for the items you want in a drop-down menu. I know that some merchants have been frustrated that Square can’t auto-populate a PO using low inventory items. Others are also frustrated that they can’t see how many of an item are in stock. Instead, these merchants wind up flipping between tabs or screens to formulate a list of what is needed. Shopventory has a handle of the same shortcomings that Square for Retail does in this regard. Namely, you can’t auto-populate a PO based on low inventory, and you can’t view stock levels in the PO.Â However, you can clearly browse every item associated with a vendor and select which ones you want to add to it. This kind of display seems kind of obvious, and it should be, but it’s not. This might be the one area where I think Square has a modest upper hand. For one, Shopventory lacks the ability to edit POs or archive them to clear them out of your way while preserving the information. (The company says it’s working on this last bit.) But you can save as a draft, just like you can in Square. So if you’re not sure or you’re not ready, you don’t have to send the purchase order out into the world. With Shopventory, you also need to create your entries for vendors before you start the PO. Square for Retail’s pricing is very simple: $60/month per register. No tiered packages, no add-ons, no extra fees for priority phone support. That’s fairly competitive for an iPad-based POS system. But as we noted in our full review, Square for Retail actually removes several of the features available in the standard (and free) Point of Sale app. It’ll be up to you to decide whether the new interface and new inventory tools justify the cost. Thinking more broadly, you’ll also need as many iPads as you have registers ($350+) and likely a Square Stand with a reader ($169) as well as any cash drawers, printers, and bar scanners you want for each device. However, there is one caveat: Square for Retail provides employee management for an unlimited number of employees. With the standard Square plan, that cost is $5 per employee per month. So if you have 12 employees and one register, you actually break even on costs. Shopventory’s pricing plan is focused not on the number of devices or the number of users, or even the number of transactions. Pricing is based just on the number of locations. There’s a limited free plan that provides analytics, but the paid plans start at a very reasonable $30/month. If you want access to purchase orders, vendor management, and the bundling features, you’ll need to get the standard plan. The starter doesn’t support these capabilities at all. In addition, the higher-tier plans throw in a few other perks (free QuickBooks syncing, otherwise $30/month; access to beta features, phone support). You can also save a bit of money if you opt to pay for Shopventory on an annual plan instead of a monthly one, which is nice. I think designing an inventory system whose pricing focuses on locations is the smart option. While I think Shopventory’s pricing is definitely better, I can’t say definitely that it’s the better value overall. For one, Square for Retail is optimized for businesses with very large inventories. And if you’re dealing with hundreds and hundreds of items you might prefer the search-and-scan based user interface that the app offers. But if you have a small inventory, or you’re not a retail business, and still want all the management tools? If you don’t care about the UI but want some of the Square POS features like offline mode or open tickets? It’s pretty obvious that Shopventory is the better solution. What’s right for you will depend on your priorities and your budget, so check out our complete reviews of both services before you commit to anything. Both of these solutions are web-hosted, which is awesome. Yay for the cloud! Don’t forget that you’ll also get some in-app reporting capabilities if you don’t want to log into a web browser, but they aren’t inventory driven, and they’re far more limited than using the web dashboard. Apart from a small team on the Square Seller Community (a forum for online merchants), Square for Retail doesn’t have any exclusive support channels that are separate from regular Square support. So you should expect business as usual in this regard. Square’s been plagued by complaints of shoddy customer service pretty much since the beginning. But honestly, I think most of those complaints are rooted in Square’s tendency to freeze or terminate accounts. For most technical (not account-related) issues, Square does seem to offer more reliable support. There’s email and live phone support, as well as a very comprehensive self-service knowledgebase. And the Seller Community is honestly a great resource as well. But I find that the amount of information and how-to’s concerning Retail specifically to be troubling. There’s not a lot. Square has tons of videos but they seem to gloss over showing how to use the Retail app. If you want to know about specific features before you sign up, you should get on the Seller forum and ask. Otherwise, the only way to find out is to test-drive Square yourself. Not only that, but it certainly seems like the process of obtaining a code to access phone support requires more effort than some merchants are willing to put forth. I get it. I loathe automated menus that make you jump through hoops to get to a real person as much as anyone else. And I’ve heard a smattering of complaints about email support. I think Square’s support is mostly good, but occasionally something does go wrong. If you one of the merchants who’s felt frustrated at Square’s support, you’ll probably be pleasantly surprised at the quality if Shopventory’s. Phone support is only available for higher-tiered plans, but the chat option is great and the knowledgebase is extremely helpful as well. (I know. I’ve tested both.) The chat option isn’t quite live chat because it might take a few to get someone to answer your question, but once you get one of the reps to respond, it is a live conversation. I shouldn’tÂ have to say this about any customer support, but sadly I do: IÂ like that you get to talk to a helpful person who isn’t going to shoehorn you into a script. Shopventory isn’t quite large enough to have the kind of active forum that Square has for support, but the knowledgebase is easily as detailed as Square’s. I find the video tour is super useful as an orientation to Shopventory, despite how much I absolutely hate watching video tutorials longer than about one minute. It’s worth noting that you’ll still have to deal with Square for payment- and account-related issues if you use Shopventory. But for inventory-related issues, you can deal with Shopventory instead. At this point, merchants’ biggest point of contention with Retail is that in some ways is a step back from the standard Point of Sale app. A few features are lacking in the Retail app. Plus, I’ve seen complaints that features Square promised at launch (or at least showed in screenshots) haven’t actually appeared yet. Problems With Cost Of Goods Recording And Reporting: This is a big one and it manifests in a lot of ways. Currently, the only way to update costs is to upload a spreadsheet. The app itself doesn’t allow you to manually edit individual item costs, and Square’s current reports don’t list item costs on everything. Merchants who were expecting to finally get COGS reporting haven’t been thrilled, though Square does say it’s on their list of improvement to make, so we may see some enhancements. Lack Of Features: Specifically, with Retail, you lose access to Square’s offline mode and the open tickets capability. You can upload images as part of the item listing, but they don’t display in the app. Merchants have complained about their removal. I haven’t been super thrilled about how Retail feels like a step back from the Point of Sale application in terms of interface and features, either. And one big missing feature that I’ve seen a lot of chatter about is the ability to auto-populate purchase orders based on low inventory (or even the ability to see the inventory count in the same window as the PO). There’s a lot less user chatter about Shopventory overall (which makes sense with a smaller customer base). I think users who integrate with PayPal or Clover will probably be more dissatisfied than Square users, honestly. I think some merchants will dislike the same sort of shortcomings you find in Square for Retail: missing features like the ability to view inventory levels while creating a purchase order, or the ability to edit purchase orders. Overall, the comments I see from merchants are positive. Square gets a lot of love overall for its payment processing. Signup is quick and easy, rates are fair and affordable, and the hardware is good and fairly priced. But the Retail app seems to be less popular overall. In theory, it fills a niche that businesses with a high quantity of inventory have been needing. I know a lot of merchants were excited at the prospect when it launched, but I haven’t seen as much talk about it since then. I don’t see a whole lot of chatter around the web about Shopventory. The website has a couple testimonials and I’ve seen the Square Seller Community talk about it, too. The discussions I’ve seen a focus on theÂ good customer service and its fair pricing. I’m calling it a draw here. Both options are good ones and serve their purpose, but there isn’t enough of a discussion to say which one has more positive coverage. I can’t say definitely that Shopventory trounces Square for Retail in every regard. One is an inventory management add-on, the other is a full-fledged POS with inventory management. So I can draw apples-to-apples comparisons about some things and say that yes, Shopventory has more and better quality inventory features. Its pricing is way more competitive if your only concern is inventory tracking. It will work great as an add-on to Square Point of Sale. But Square for Retail has a search-optimized UI and free employee management tools that might be deciding factors for some merchants. So you could potentially get a better value with Square for Retail if you have a lot of employees and want easy time tracking along with the ability to manage large inventories. The good news is we’re looking at two companies that are both committed to adding new features all the time. So in six months or a year, we could be looking at two majorly improved products. We’ll have to see how they stack up then. Check out our complete reviews for Shopventory and Square for Retail to get a closer look at each.Â Also, both Square for Retail and Shopventory offer free 30-day trials, so you can test drive both of them (preferably not at the same time) and see which one works better.Â Thanks for reading and good luck with your search! The post Shopventory VS Square For Retail appeared first on Merchant Maverick. Online sellers are always looking to expand–expand their product catalogs, expand the reach of their marketing, and expand across sales channels. And when it comes to expansion, thereâs no bigger project to undertake than international growth. Successfully going global is only possible if you have the appropriate resources in the form of products, market, and software. And while finding a market and products is up to you, we here at Merchant Maverick can help when it comes to choosing the correct software. International sellers demand more from their shopping cart setups than do domestically-based merchants. Youâll need your shopping cart to be able to display your site in multiple languages and currencies. Whatâs more, youâll need to be able to handle complicated taxes and shipping functions. Your eCommerce software should either come with these features already built in or be able to integrate with extensions to fill the gaps. In this blog, weâll be discussing four carts that offer merchants the features (and integrations) they need to sell internationally. These software companies maintain a global focus, giving you multiple options for global success and staffing a diverse team of developers from all across the world. If you need the power to create a multilingual site — and a multilingual support team on hand at the momentâs notice — look no further than this list. Keep reading to learn which eCommerce software programs we recommend for global expansion. With PrestaShop, international is the name of the game. PrestaShop is behind 270,000 stores worldwide. They have headquarters in Miami and Paris and employ over 100 employees who are proud to speak a variety of languages. PrestaShop is open-source software that is free to download, highly customizable, and offers loads of add-ons. With a strong international user community supporting the development of the software, you can expect new releases and extensions regularly. PrestaShop’s biggest downfall is that youâll need developer skills in order to best use the software. Whatâs more, PrestaShopâs customer support costs a bit more than you may be willing to spend. Set Currencies & Automate Exchange Rates: Set your shop to accept a wide number of currencies. Multi-language Product Sheet: Quickly import product information in multiple languages. International Forum: Find support from other users in a variety of languages. PrestaShop Translation Product: Users can assist in translating new versions of PrestaShop. International Add-Ons: Purchase and download extensions from international developers to further broaden your storeâs functionality. For more information on PrestaShop, check out our full review or try one of PrestaShopâs easy-to-access demos. WooCommerce is one of the most widely used eCommerce solutions around. While the stats are uncertain (WooCommerce claims a part in 28% of all online stores, while BuiltWith says Woo is behind 42%), what is certain is that Woo is enormously popular in the eCommerce world. WooCommerce is free, open-source software that plugs directly into WordPress.com. It is highly customizable and scalable. WooCommerce’s Achille’s heel, as with many open source solutions, is the unfortunate combination of limited customer support and a moderate learning curve. WooCommerce also follows a Core+Extensions model, which means that built-in features tend to be rather basic. Despite these obstacles, WooCommerce is an excellent choice for international sellers. With employees located in 19 different countries, youâre sure to find support in a range of languages. And given the many international developers contributing to the project, international features are well within reach. Calculated Taxes: Set tax rates for the countries and regions in which you sell your products. Show taxes based on your customerâs shipping address and billing address and your storeâs base address. Supports International Transactions: Accept multiple currencies with the right payment gateways. WooCommerce Translation Project: Users help make WooCommerce available in multiple languages. For more information, take a look at WooCommerceâs tips for selling internationally. Or, head over to our review and download the software for free. If youâre looking into open-source solutions, but our first two suggestions donât quite meet the mark, you should take a look at Magento. Magento is used by developers worldwide and supports a user base of 250,000 merchants. With such a wide base, the Magento marketplace is always growing. You can expect a steady release of new extensions and payment gateways from Magentoâs global developers. As an open-source software solution, Magento comes with similar advantages to PrestaShop and WooCommerce. The software is free to download, highly customizable, and scalable. Magento includes a robust feature set and boasts an international user community. As you might expect, the trouble with Magento lies in its usability. In order to best utilize the platform, youâll need to have confidence in your developer skills. The software comes with a steep learning curve, and there is no phone number to dial for technical support. International Forum: Get help from a community of 150,000 developers. These developers can also help you create extensions that work for your target countries. Extensions: Take your pick of a vast marketplace of extensions. Youâll find extensions for international payment gateways, currencies, and shipping carriers. For more information on using Magento to sell globally, take a look at the company’s advice on making your site global ready. To learn more about Magento in general, head on over to our full review or get started now by downloading the platform for free. If youâre in the eCommerce industry, youâve heard of Shopify. This Canadian SaaS solution is famous for its usability and clean design. And over the past few years, Shopify has skyrocketed in popularity. The platform now hosts over 500,000 stores worldwide. Shopify is the only hosted solution weâll be including in this list. In general, if youâre looking to build a website that reaches customers around the world, open-source is your best approach. With so much opportunity for customization and growth, youâll likely find that an open-source solution better fits your international storeâs needs. However, like we’ve discussed, open-source comes with its own challenges, including limited usability and technical support. And so, if you want toÂ take a global approach but arenât sure you can handle the technical challenges of open-source, Shopify may be the way to go. Multi-lingual Checkout: You can set your checkout to operate in over 50 languages. Youâll need to translate the rest of your theme on your own. Non-US Taxes: Set up tax rates for other countries. You can also set your store to charge taxes on shipping rates. Numerous Payment Gateways: Take your pick from over 100 payment processors in order to accept payments worldwide. For more information on Shopify, take a look at our full review or get hands-on experience by signing up for a free 14-day trial. Hopefully, one or more of these shopping cart options has piqued your interest. As always, I encourage you to take your research further. Read our full reviews, look up comments from current customers, and take advantage of every trial and demo you can get your hands on. You might also read our article, The Most Important Questions To Ask Before Shipping Internationally, and download our free eBook, The Beginner’s Guide To Starting An Online Store. In this fifty page guide, we unpack everything you need to consider as you approach online selling. But for those of you who are already planning your global expansion, I wish you the best of luckÂ and bon voyage! The post Best Shopping Carts For Global eCommerce appeared first on Merchant Maverick. Startups are inherently risky endeavors. According to Fortune Magazine, close to 60% of new startups fail. Because new businesses are so risky, it is notoriously difficult to obtain startup financing — most banks won’t lend to you unless you’ve been in business at least two years. While some online lenders offerÂ startup loans, startup grants are another option for new business financing. A startup grant is even harder to get than a startup loan, but grants are more desirable because you don’t have to pay the money back. Want a shot at a startup grant? Follow these steps to find a business grant you might qualify for. Generally, only certain types of businesses qualify for startup grants. If your biz doesn’t fall into one of these categories, it’s unlikely you’ll qualify. For example, while there may be grant money for an innovative hardware manufacturer, when it comes to a run-of-the-mill hardware store…eh, not so much. Then again, if you face the significant hurdles of having a female-owned hardware store opening up shop in anÂ economically distressed region, it’s a lot more likely that a private or public entity might want to give you some free money. Read my post Do I Qualify For A Startup Grant?Â to determine if your business falls into one of the industries likely to qualify for startup grant funds. If not, you might want to start considering other alternative financing options, such as crowdfunding. City and township governments, business associations, and nonprofits in your immediate region are good places to start looking for grants. Even if you determine that your business doesn’t fit into one of the “grant-worthy” categories I mentioned above, you might be eligible for a grant if you’re starting a business in a certain city or region. For example, the Arch Grants organization awards grants to new businesses in the St. Louis area. There are not too many of these sorts of grants, but it’s always worth checking. Be sure to scan city, county, and state websites for grant opportunities, as well as your local Chamber of Commerce. If you’re willing to relocate, you can also check local business grant opportunities in the city or cities you’d consider moving to. If you can’t find any grant opportunities for businesses in your area, you can search grants by niche; that is, by your particular industry or business type. Your startup may fall into multiple niches — for example, your business may be veteran-owned and also a clean-energy business. Simply searching a phrase like “business grants for green construction” or “grants for home daycare” may deliver results tailored to your specific business niche. Sometimes grants are for a particular niche and also a particular region. A couple examples of niche business grants include the Halstead Grant for new silver jewelry designers living anywhere in the US, and the Green Technology Business Grant ProgramÂ for green technology startups in Cleveland, Ohio. Several large corporations offer business grants or host some kind of small business contest where the best businesses can win free money. These grant programs are highly publicized and thus highly competitive, but they might be worth looking into. FedEx, Miller Lite, and Visa are a few corporations that award business grants; Miller Lite’s grant contest is especially aimed at startups. Even some popular business lenders offer business grant contests.Â Veteran-owned businesses, for example, should look into StreetShares‘ annual business contest for veterans. Small businesses can potentially find grants they are eligible for on Grants.gov, the one-stop-shop for government grants. However, you should know that the vast majority of these are medical research grants. Also, even if you’re eligible for one of these prized federal grants, you’ll likely be competing with nonprofit organizations, and even city and state governments. The reason I listed federal grants last is that there are few, if any, federal grants a typical startup business would be eligible for. However, at least a couple federal grants are aimed at innovative small businesses, and these are Small Business Innovation Research (SBIR) grants for high-tech businesses involved inÂ scientific research & development. The InnovateHER grant contestÂ is for businesses that benefit women and children. This blog post on the SBA website explains a little more about US government grants and how most are not really aimed at for-profit businesses. If you want some government help in funding your small business, you might want to look into a Small Business Administration (SBA) loan. These loans are low-interest and relatively easy to apply for if you use an online SBA lender like SmartBiz. Once you find a list of startup grants you’re eligible for, the next step is to start preparing your grant application package. The application process is slightly different for each type of grant, but usually you will have to submit a business plan and Request for Proposal (RFP). For a large grant, you might even consider hiring a professional grant writer, though this probably wouldn’t be feasible or necessary for a grant contest where you only stand to win $2,000-$5,000, even after beating out thousands of other applicants. The last thing I’d recommend to anyone searching for startup grants is to review startup grant alternatives, such asÂ small business loansÂ or alternative business financing options like P2P loans or equipment financing. If you have any questions about startup loans or alternative business financing, feel free to email us or ask in the comments! The post How To Find A Startup Grant appeared first on Merchant Maverick.